The earthquake hit in the ocean, catching people off-guard. An earthquake hit off the coast of Ocean City on Tuesday night, just as many residents were returning home from work. 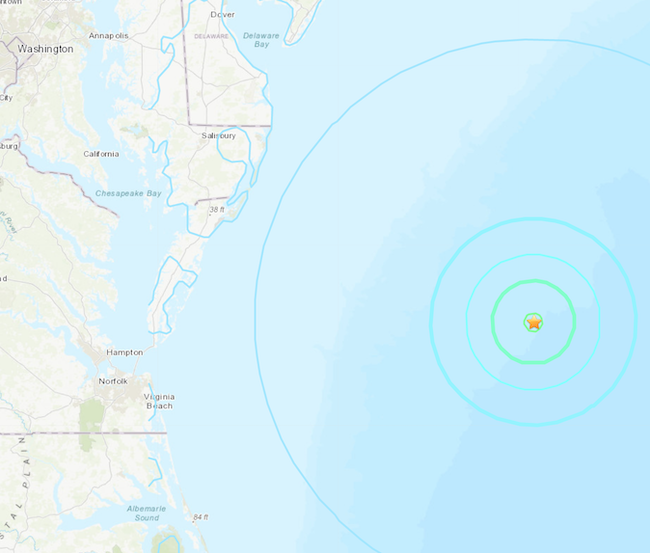 The 4.7 magnitude quake was centered 136 miles off the coast of Ocean City at a depth of 10 kilometers under the ocean. The quake struck at 6:30 p.m. ET, and no tsunami warnings or watches were issued. People in Maryland, Delaware, and Virginia reported feeling the quake but there were no reports of damage. On Wednesday morning, the seaside town wasn’t worried about aftershocks, instead focusing on clean-up of Sunday’s snowstorm. The United States Geological Survey, the government agency that monitors earthquake activity, is one of the agencies affected by the shutdown and offered limited information on Tuesday’s event. Resident responses were muted with single digit reports listed on the USGS citizen response site. The location of the earthquake lessened the chances of a tsunami. Most tsunamis are triggered by quakes higher on the Richter scale, like 7.0 or more. The last major earthquake to hit the region was a 5.8 magnitude on Aug. 23, 2011. That quake originated in Virginia, about 90 miles south of Washington, D.C. It triggered several aftershocks and was felt by more people in recorded history, stretching all the way to Canada. Several buildings in the nation’s capital were damaged in the quake. The Washington Monument sustained cracks near the top of the structure and was closed for three years while it was repaired. The Washington National Cathedral had damage to three of its spires and flying buttresses. Nearly eight years later, the cathedral is still under repair from the damage. You can view current earthquake activity across the world by visiting the USGS website. Citizens can also help contribute to research by submitting their own “felt report” after an earthquake event. Did you feel the earthquake last night? Tell us in the comments below! A rare calico lobster was found in a Silver Spring seafood store. Read all about it here! Check out Maryland's Our Community Now for more local news, events, and features that bring us all together!